1. The roof and wall is EPS sandwich panel. However, there are other materials you can choose, such as the Rockwool sandwich panel, Polyurethane sandwich panel, PU foam sandwich panel. 2. The frame is the C section steel and the Angle iron. The thickness is depend on you! 1. Used in building site, low cost, easy installation, reusable. 2. Used in building site and can be reused in lots of projects, which is very economical. 3. Used for accommodation, office, control center, canteen and so on. 4. 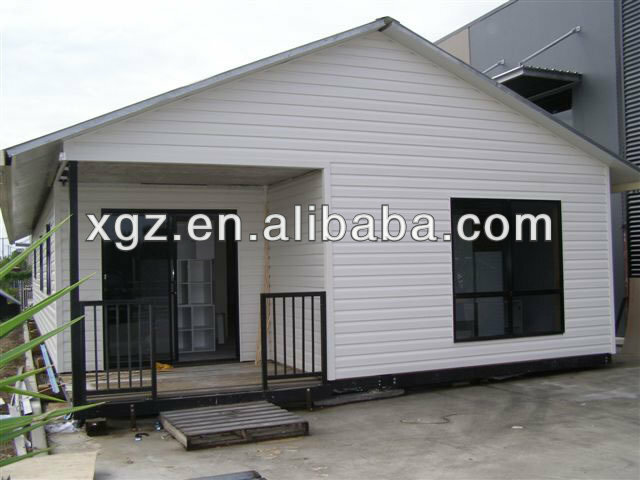 The low-cost, easy assemble and disassemble, reusable are the most outstanding advantages of this house. 5. We can design the style according to your different requirements and the building site weathers. It's fireproof, waterproof, quakeproof and heatproof. 6. The partition of the wall is depend on you, we can design what partition you want. 7. Excellent in the feature of typhoon and earthquake proofing grade is 8 grades, and the earthquake proofing grade is 7 grades. 8. The using life is around 10-15 years .Environmental protection and economy. 9. Each worker can assemble 20~30 square meters every day. 6 workers can finish 300sqm prefab house in 2 days. 10. Loading: 320 square meters can be loaded in one 40 feet shipping container. we are looking forward to cooperating with you for long-term business relationship and mutual benefit.